Picking the readers winning coupons... from left. 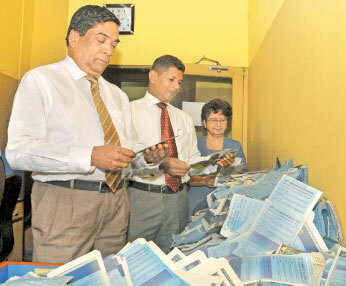 Sarath Mandalawatte ( Head Of Division Fund Management ANCL), Ajith Fernando (Manager Cash ANCL) and Dr. Pushpa Mallikarachchi ( Medical Officer ANCL) picking the winning coupons. 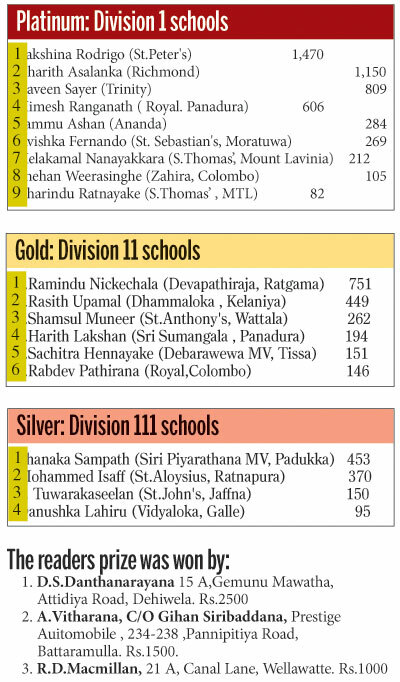 Lakshina Rodrigo occupied the first place polling 1,470 votes , while Richmond's Charith Asalanka and Trinity's Reveen Sayer were placed second and third polling 1150 and 809 votes respectively at the end of count number two at the Sunday Observer/ Mobitel Most Popular Schoolboy Cricketer Of The year 2015 contest. Trinity's Raveen Sayer was in the last year's contest too, and has been performing well this year for his school.